Landlord. For too many of us, the idea of being one outweighs the benefit of getting extra income from a rental property. Bruce Lessey says it doesn’t have to be that way. His Houston 4 Lease team handles all the heavy lifting of property rental. Moving up? Don’t sell your house. Call Bruce. Transform it into a source of extra income. Already renting? Bruce takes all the work out of it for you. Houston 4 Lease even automatically deposits your net rental income every month for you. Bruce makes being a Landlord easy. Learn how. 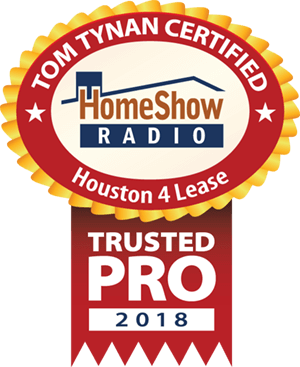 Serving the Greater Houston area, Houston 4 Lease is a trusted HomeShow Pro, certified by HomeShow Radio’s Tom Tynan. How can Houston 4 Lease help you?